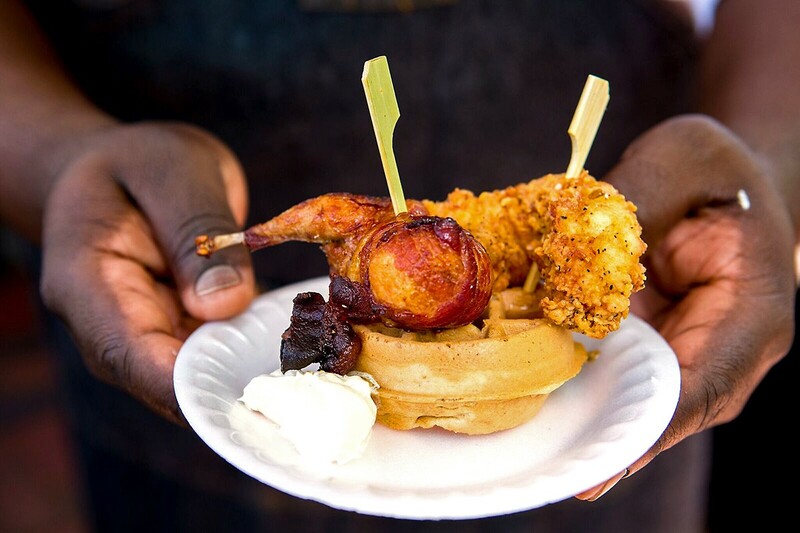 Indulge in unlimited small bites at the two-day long Sugar Land Wine & Food Affair Sip & Stroll! Updated, 4/8/2017, 11:19 a.m.: Saturday’s Sip & Stroll tickets are sold out but there is a limited quantity available for Sunday! The Sugar Land Wine & Food Affair’s popular “Sip & Stroll” event now runs on both Saturday and Sunday! The Sip & Stroll has been combined with the popular brunch event of prior years. Tickets are available now online. The hours on Saturday are from 3 to 6 p.m. and on Sunday from 11 a.m. to 2 p.m.
Indulge in unlimited bites from dozens of area restaurants in and on the grounds of the historic Imperial Sugar factory. For sips, choose from dozens of top quality wines, stroll the craft beer garden or judge for yourself the award-winning, official cocktail of the event, sponsored by Hendricks Gin. Saturday and Sunday feature different lineups of chefs, so there are many good reasons to attend on both days! The Sip & Stroll is also a rare opportunity to try the cuisine of chefs and other food professionals who have traveled a long way just to participate in the Sugar Land Wine & Food Affair! Academe at the Kennebunk Inn, Kennebunk, Maine: Academe’s proprietors Brian and Shanna O’Hea are frequently featured on Food Network and also own Maine Lobster Pot Pie. Rocky Mountain Institute of Meat/Primal Meat Co., Colorado Springs, Colorado: Highly respected butcher Jason Nauert of Colorado Springs will show off over 30 years of experience at the Sip & Stroll. Santacafé, Santa Fe, New Mexico: Chef Fernando Rui owns this New Mexico restaurant and is a recent winner of Food Network’s “Chopped” and “Guy’s Grocery Games” competitions. City Pork, Baton Rouge, Louisiana: Corporate chef Ryan Andre is a native of Gonzales, Texas and spent years working every kitchen position at Commander’s Palace before taking his current role over all City Pork locations. Guerrilla Gourmet, Victoria, Texas: Executive chef James Canter’s food truck menu is influenced by his culinary experiences across America, including California coastal cuisine and his uncle’s Chesapeake Bay seafood restaurant that Canter grew up around. Jazz, TX, San Antonio, Texas: Executive chef Lorenzo Morales’ menu at this music venue in the historic Pearl Brewery center reflects his love for comfort food like chilaquiles, seared flat iron steak and vegetable pot pie. Shih-Chien University, Taipei, Taiwan: Eight culinary students will be highlighted at the Sip & Stroll event as they serve tea and tea cakes to represent their culture. Dr. Joy Kao, Department Chair of Food & Beverage Management, will lead the group. Cicada Catering Company, Victoria, Texas: Chef James Foote will serve paella, which has landed him several awards in the annual San Antonio Paella Competition. Fischer & Wieser’s Culinary Adventure Cooking School, Fredericksburg, Texas: This cooking school in the heart of the beautiful Texas Hill Country is led by former Houston-based author and journalist John DeMers. Rockstar Bagels, Austin, Texas. The bakery, which supplies restaurants as well as customers at a walk-up window, is known for their traditional New York-style bagels: fermented, boiled and freshly baked seven days a week.